Rating: 3.5/5. From 123 votes. Steve on 01-Apr-2019 | Reply	Problem with this review? “I do believe we need one very objective, youth review. So first of all, personnel are either not happy and stuck with their problems or they are just that way. Helpful but extremely greedy. 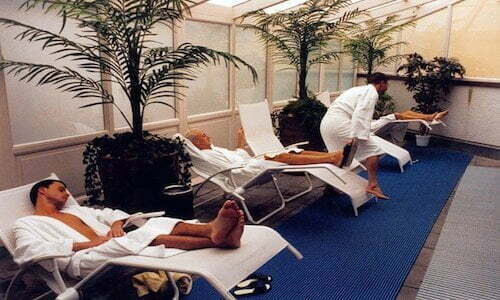 When it comes to the facilities I was quite satisfied, there are places to relax, places to enjoy. Very clean and great. If you are a smoker it's a good thing since they have a smoking lounge. When it comes to food and drinks I do believe it is extremely expensive but I get it. Michael on 19-Aug-2018 | Reply	Problem with this review? Max on 13-Aug-2018 | Reply	Problem with this review? “I went there on Monday 28 May 2018. I was surprised with how big the facility is, a lot of cruising area (sling and glory holes etc). Unfortunately the sauna itself is very small. Only 3 were working (not sure if there were more there). One dry kinda stunk and wasn't too hot. Steam sauna I hated. The part that was with a bench to sit on was cold! and not much steam in it, when you go deeper to the next room it was nowhere to sit cause it's a maze and guys have fun there and are catching you and stop you (which is ok when you want to play but sometimes all I need is to relax in it). When you step further it's pitch black and I was afraid to hurt myself. The layout is very confusing. Multiple levels so lots of stairs walking. I never figured it all out. Lots of play spaces, but it's system is "you must rent a room for privacy". Like most saunas these days it wasn't terribly crowded but the crowd was nice. People are rather shy and not talkative. I was in a jacuzzi and no one ever said a word. Well there was a sign on the wall about not talking but i think it's not great. For the dark/play space it is very confusing and you can get easily lost. It's kind of a labyrinth full of corridors and private cabins that you have to pay for. Some of the corridors are way too black for me. Maciej on 01-Jun-2018 | Reply	Problem with this review? Nic on 24-Dec-2017 | Reply	Problem with this review? Alex on 06-Nov-2017 | Reply	Problem with this review? “I came here at around 8 on a Friday evening. The place is easy to find but it was less busy than I expected. As many other people said, most the the customers are above 30 and only a few young people were there. anger on 09-Jul-2017 | Reply	Problem with this review? G on 06-May-2017 | Reply	Problem with this review? Great place for much fun! terje on 30-Sep-2016 | Reply	Problem with this review?